*Price – NB early bird discount is applied automatically if available: for the Member rate, please login to your account. Book three training days at once, or three places on a course, and save £20 on each of them! To take advantage of this offer, add the three events to your basket, and use the coupon code: EEDISCOUNT3 – the discount will automatically be applied at the checkout. Woodwork is hugely popular and provides a rich source of enjoyment as well as learning. The impact is profound and long term. Deep levels of engagement and intense concentration are common and the children often remain involved in their explorations for extended periods. Woodworking allows children many opportunities including; expressing their imagination, problem solving and sustained perseverance with challenging tasks. The learning outcomes have been remarkable and encompass all areas of the EYFS. 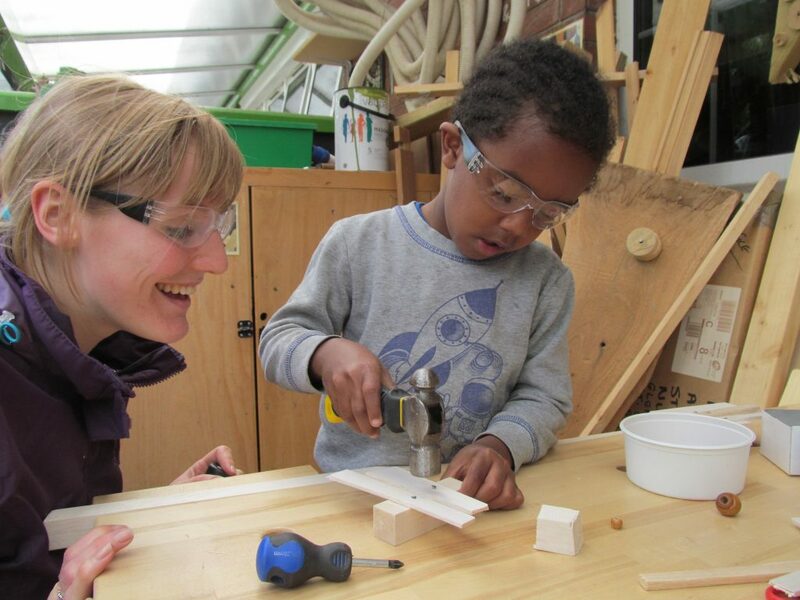 This practical session will look at ways in which woodworking can be safely introduced in your early years settings. We will look at the theory and how woodwork meets many learning and development aspects of the EYFS. We will examine the historical context and look at examples from other countries that have been working successfully with wood for many years. There will be explanations of the most suitable tools for young children and instruction on how best to use them. We will look at the most suitable woods. Information on potential suppliers of wood/ tools will be provided. Explanations on how to set up a woodworking area. Suggestions for activities, open-ended explorations and longer term projects. There will be practical elements during the day for practitioners to explore the tools, gain confidence and share the experience of making creations in wood. Understand the value and theory of woodwork. Learn how to introduce woodwork safely, implementing an effective risk assessment. Understand the most suitable tools for young children and how to use them. Be confident to develop a woodworking area. You can view Pete’s profile on his dedicated Associates page.